D.J. Waaland of Co-Optimus reports that PD Design Studios has a new 2D brawler, Dusty Raging Fist, coming to the Wii U’s eShop. It’s apparently in the same universe as Dusty Revenge, a fighting game in development and on Steam Greenlight. I’ve never heard of Dusty Revenge, but I’m much excited at the thought of a good, 2D brawler. It’ll feature three player co-op, so this sounds like my type of game. The art looks gorgeous to me, reminding me of Guardian Heroes. Then again, Code of Princess for 3DS reminded me of Guardian Heroes and let me down. Still, I’m hopeful. Can I file this game away with River City Ransom, Turtles in Time, Castle Crashers, and Scott Pilgrim? I certainly hope so. 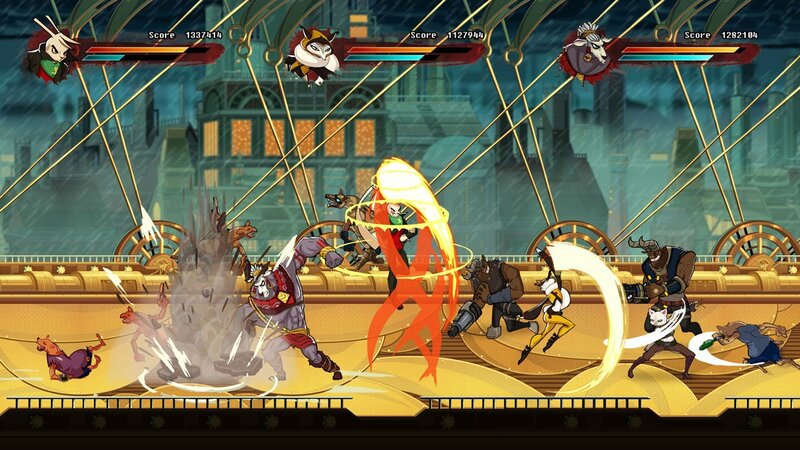 Source: New 2-D Brawler Announced for Wii U – Dusty Raging Fist, D.J. Waaland, Co-Optimus, 2/25/13 via Nintendo Life. Kinuko, one of the artists behind Scott Pilgrim vs the World: The Game, created all the NPCs in the game. She shared some of the sprites on her Tumblr, so I thought I’d share the link. Note that this entry is fine, but her Tumblr in general is NOT safe for work. Kinuko, Scott Pilgrim: The Game NPC Sprites, Kinuko’s Tumblr, 9/2012. Kinuko also draws as part of Mecha Fetus (note that the Mecha Fetus Visublog is very, incredibly not safe for work). They created the Nice Girls Nice Hats art book that I purchased at Anime Expo a few years ago – 2009 maybe. Anyways, they’re all very talented artists! When I saw that Jonathan Kim of Mechafetus (NSFW) fame was an animator on a new game, I was intrigued. He was an animator on Scott Pilgrim vs. The World: The Game and senior animator on Skullgirls. Then I saw that Mercenary Kings also features Paul Robertson, art director of Scott Pilgrim vs. The World: The Game, as animator. A handful of people from the Scott Pilgraim vs. The World: The Game’s development team came together to create Mercenary Kings, a run and gun game featuring upgrades and customization. Mercenary Kings looks a lot like Metal Slug but with a Mechafetus twist. That would be enough right there to get me interested, but they’ve mixed in crafting. Enemies drop materials when they die, and you can upgrade and customize your weapons. Individual parts of the weapons can be changed, allowing you to design weapons that work the way you want. It looks like a lot of fun, but the art style is what really drew me to it. You got that right; I get an exclusive wallpaper pack!